"Do you think that humanity can ﬁnd a way past the current global environmental and social crises? Will we be able to create the conditions necessary for our own survival as well as that of other species on the planet? What would these conditions look like? In summary, then, and in the plainest of terms, do we have hope, and can we do it?" The contributors include writers, environmentalists, spiritual leaders, politicians, professors, doctors, athletes, business people, farmers, chefs, yogis, painters, architects, musicians, TV personalities, humanitarians, children, concerned students and senior citizens, carpenters, factory workers, activists, CEOs, scientists—essentially people who have something passionate and insightful to say about humanity's place on Earth. Well-known people on the list include environmentalists such as David Suzuki, Paul Hawken and Jane Goodall; scientists such as Stephen Hawking and Edward O. Wilson; personalities such as Jamie Oliver, Maya Angelou, Les Stroud and Bruce Cockburn; humanitarians such as Nelson Mandela and Archbishop Desmond Tutu; political figures such as Mikhail Gorbachev, Justin Trudeau and Elizabeth May; writers like Temple Grandin, Farley Mowat and John Ralston Saul; and spiritual leaders like His Holiness The 14th Dalai Lama of Tibet and Lama Surya Das. 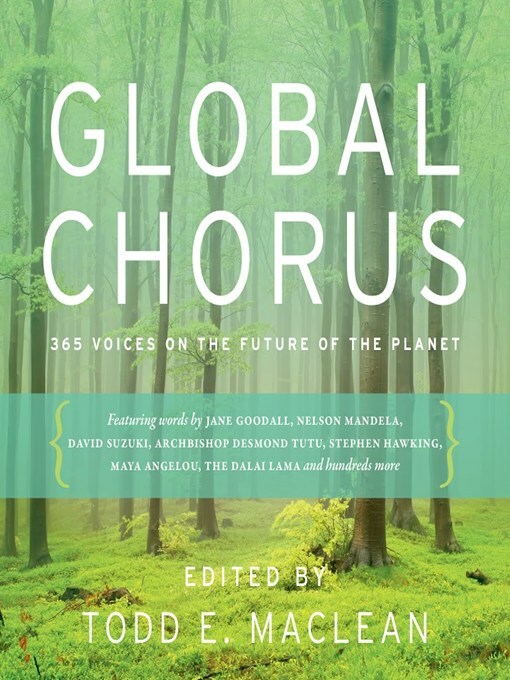 The vast majority of the contributions contained within Global Chorus are completely original, with some coming from public speeches or previously published sources.